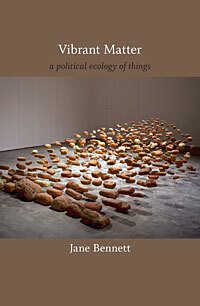 Jane Bennett argues in Vibrant Matter that things--matter, objects, energy, processes--can be just as active politically as humans. In this special podcast series, I try to explain the basics of Bennett's arguments for this "vital materialism" and then explore some of the ways that it might be used by us. The series consists of a bunch of chapter-by-chapter summaries and responses and one big overview podcast that summarizes and responds to the book as a whole. This post indexes each chapter by chapter summary and the final podcast.